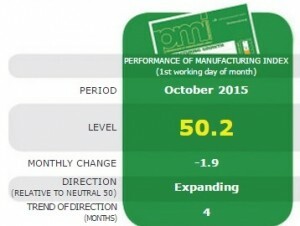 The Australian manufacturing sector has expanded for a fourth consecutive month, falling 1.9 points to 50.2 in the month of October. “A strong export performance in October helped manufacturing hold onto the gains made by the sector over the previous three months, clocking up the longest expansion in five years,” said Ai Group Chief Executive, Innes Willox, in a media release. According to the latest Australian Industry Group report, four of the eight manufacturing sub-sectors expanded; wood and paper products fell 5.5 points to 64.0; textiles, clothing, footwear, furniture and other manufacturing increased 0.5 points to 56.9; petroleum, coal, chemical and rubber products was also up 0.3 points to 57.5, while non-metallic mineral products recorded a 3.6 point increase to 52.6. After sixteen months of expansion, food, beverages & tobacco was broadly stable, falling 3.8 points to 49.7. The machinery and equipment sector recorded an increase of 2.2 points to 45.0. “The wages sub-index increased by 2.7 points to 57.7; subdued annual wage growth likely reflects declining demand for labour in the manufacturing industry (-3.3% p.a. in August), a stubborn unemployment rate (6.2% in September) and very low background inflation (1.5% p.a. in September),” AiGroup said.